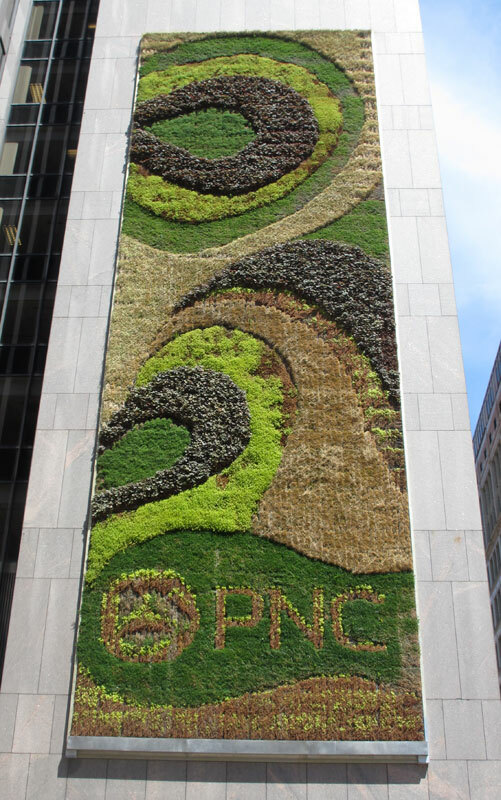 The largest green wall in North America at the time of it’s construction, the PNC Green Wall was installed as part of The PNC Financial Services Group’s ongoing commitment to the environment. 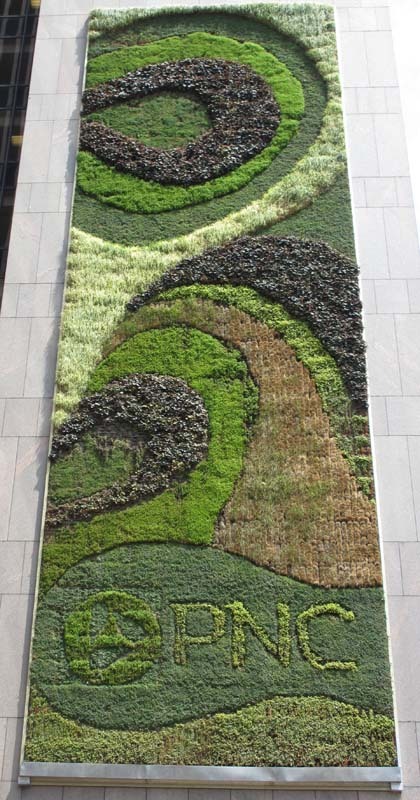 It is intended to save energy, enhance the neighborhood, and demonstrate the benefits of green design. The 602 soil–filled panels mitigate the temperature difference between the building’s interior and exterior by providing a thick insulating layer, shading, and evaporative cooling. This reduces resource use, operating costs, and PNC’s carbon footprint. The plants were selected for their ability to thrive in this climate and to create a design which varies in texture and color with the changing seasons. The wall requires only 15 minutes of irrigation per week, and it helps to cool the plaza beneath it by absorbing rather than reflecting the sun’s rays. The plants also absorb volatile organic compounds, reducing pollutants in the immediate area. A further benefit is sound absorption, making it easier to hold a conversation on this busy street corner. 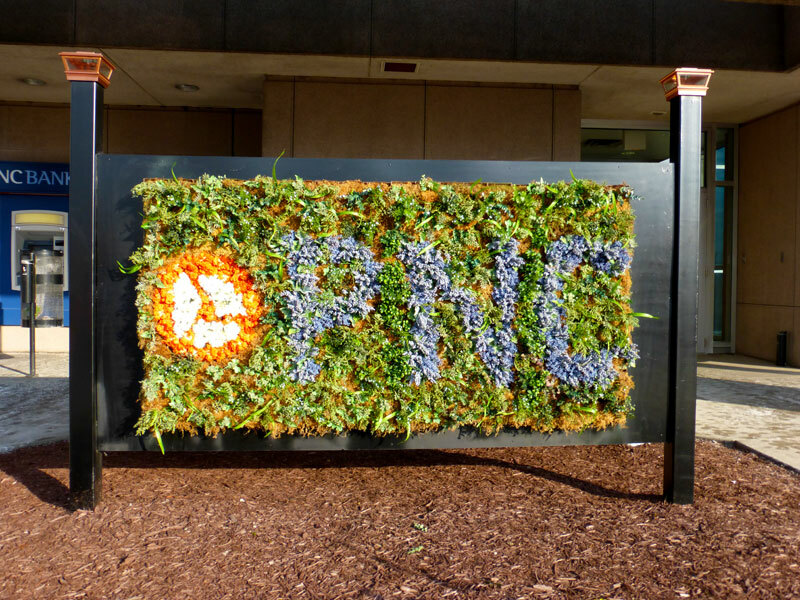 PNC’s press release at the time the wall was built explains that there are 602 modular panels (see photo above) with about 24 plants in each making the total plant count around 14,448. They estimate the weight at approximately 24 tons when fully saturated and say that studies have shown that wall is 25% cooler behind the green mural. They estimated that each of those 602 panels would offset the carbon footprint of one person. 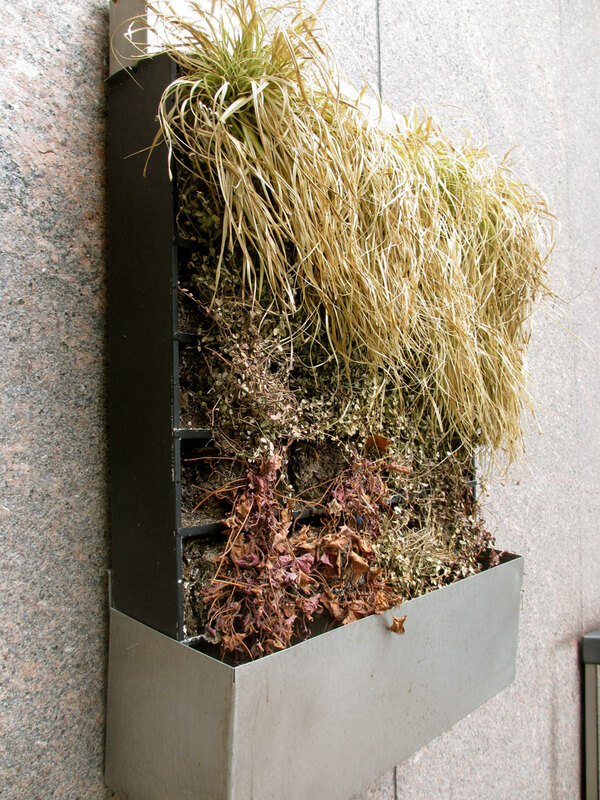 Kari Katzander of Mingo Design (NY) and Green Living Technologies are credited for the design and construction as well as others for installation and engineering work. We took the first photograph in February and although there’re some subdued greens, the mural looks a bit more brown/yellow for winter. We plan to add more photos throughout this year to show how it changes with the seasons. UPDATE – Photo taken 21 May 2013. The mural is obviously growing and taking on it’s Summer appearance. 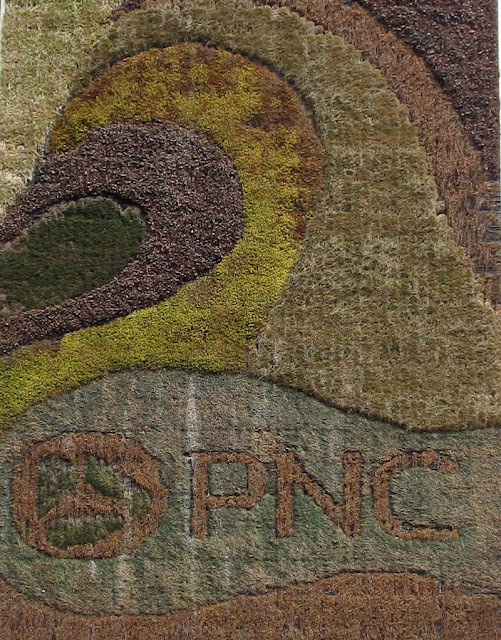 We noticed a miniature green mural at one of PNC’s branch offices. We don’t know if all of the branches have these or not. At the Cranberry Township branch office. Gone. We were hoping that this was temporary. There's scaffolding up on this wall and we held out the hope that they were perhaps making renovations to the green mural. Unfortunately, we discovered a Post Gazette article by Mark Belko that confirms the mural has been permanently removed. 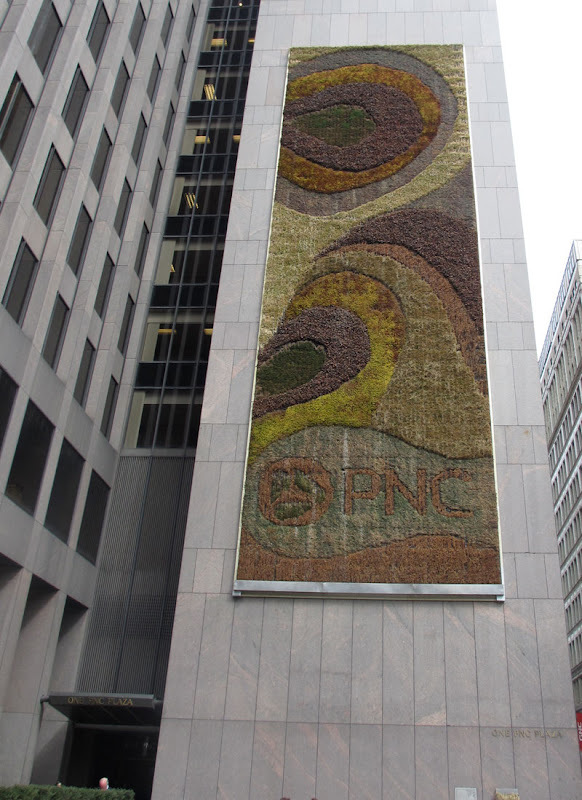 According to the article, PNC has made improvements to the building's energy efficiency that make the mural redundant. For whatever reason, they decided to not keep the mural purely for aesthetics. Since they didn't need it to help keep the building cooler in the summer (or hold the heat in the winter) they have repurposed the components of the wall in other projects and will replace the mural with granite.